Fairfax Futures collaborates on programs that promote early education in science, technology, engineering and math (STEM). The STEM Ready project provides STEM learning opportunities and resources to early childhood professionals interested in engaging young children in STEM experiences. As an outgrowth of the STEM Ready Project, Family STEM Nights invite families to share in STEM learning experiences with their children, guided by the educators in their early childhood education programs. 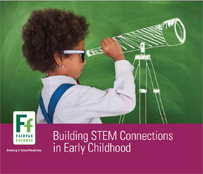 Click on the cover to view or download Building STEM Connections in Early Childhood.